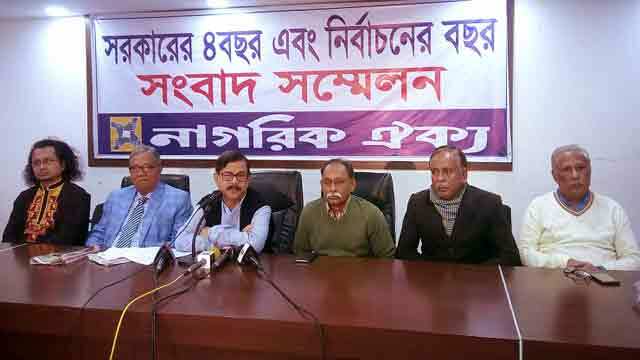 Dhaka, Jan 15 (Just News): Nagorik Oikya Convener Mahmudur Rahman Manna today rejected Prime Minister Sheikh Hasina’s plan on election-time government saying that the next general election will not be free, fair and credible if it is held under the present government. “We believe that the next general election under the present government cannot be held in a free, fair and credible manner. The Prime Minister [Sheikh Hasina] should clear her stance in this regard,” Manna said at a press conference at the National Press Club. Claiming that there is no provision about the election-time government in the constitution, Manna said. “Prime Minister will have to clarify immediately what she meant about the election-time government. In her address to the nation on Friday, the prime minister said that the next election will be held under the election time government in line with the constitution.